The Republic of Congo lies along the equator and stretches northeast from the Atlantic coast into the heart of the African continent. Its dominant feature is the CONGO RIVER, one of Africa’s most important waterways and the main highway for trade in the area. Many different ethnic groups live together in Congo’s cities, often contributing to political and social unrest. Two kingdoms and several smaller chiefdoms once occupied what is now the Republic of Congo. France took control of the region in the 1800s and claimed it as a colony for more than 150 years. Since gaining independence, Congo has struggled to achieve a stable government and economy. But internal conflict and continued exploitation by European powers have made this task especially difficult. The most important of the precolonial kingdoms were the Kingdom of Kongo and the Kingdom of Téké. The Kingdom of Kongo occupied the southwestern Congo region, with its capital in what is now northwestern ANGOLA. The Kingdom of Téké was located along the center of the Congo River, where it controlled the flow of goods between the region’s interior and the coast. The Portuguese were the first Europeans in the Congo area. Arriving in the 1480s, they maintained a strong presence there for more than 200 years. However, French traders and missionaries gradually pushed out the Portuguese, and by the late 1700s France had become the major European power in the Congo. Between 1875 and 1885, a representative of the French government, Pierre Savorgnan de Brazza, signed a treaty with the Téké king and established military posts in the region. Brazza—after whom Congo’s capital city BRAZZAVILLE is named—later became the first commissioner of French Congo. However, he was replaced when he refused to open the country to exploitation by French companies. Under colonial rule, the local population was forced to work under brutal conditions to extract the region’s natural resources and to build roads and the railroad to the Atlantic coast. After World War II, France granted the Congo a degree of self-rule and allowed limited political and social reforms. Congo won its independence in 1960, and Fulbert Youlou became its first president. In 1963 Youlou declared Congo a single-party state with himself at its head. Three days of rioting followed the announcement, and Youlou was overthrown. His successor, Alphonse Massemba-Débat, ruled for four years before being replaced in a military coup led by Captain Marien Ngouabi. Like his predecessors, Ngouabi tried to gain complete control over the government. In 1977 he was assassinated and replaced by General Joachim Yhombi-Opango. Two years later another coup brought Colonel Denis Sassou-Nguesso to power. Sassou was more successful than previous Congolese leaders in securing control over the nation. He eliminated political rivals and placed his supporters in government posts. But Sassou heeded calls for greater democracy in 1991, when he allowed the formation of a national convention that stripped him of his powers. The following year Pascal Lissouba was elected president. Sassou and others organized resistance to Lissouba’s rule, and by 1997 the nation was engaged in a violent civil war. Lissouba was forced to flee the country, and Sassou again assumed the presidency. Outbreaks of fighting and civil war continued in the following years. Congo is rich in natural resources including timber, diamonds, gold, and many different minerals. However, political unrest and a lack of infrastructure have slowed the nation’s economic development. Although many Congolese people are engaged in farming, agriculture accounts for only a small percentage of national wealth. As a result, Congo imports much of its food. Oil was discovered offshore in the early 1970s and quickly became the chief source of the nation’s income. However, a large portion of this revenue goes to the European firms that have helped Congo develop its petroleum resources. 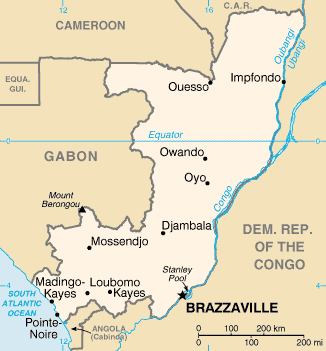 Other industries—including food processing and textile production—are located in the three main cities of Brazzaville, Pointe-Noire, and Nkayi. Congo consists of four main regions: the coastal plain, the Nyari Valley, the Téké Plateau, and the Congo Basin. All the regions experience two dry and two rainy seasons per year. The coastal plain has a cooler and drier climate than the rest of the country. The Nyari Valley, just northeast of the coastal plain, features fertile soil that produces many of the nation’s crops such as coffee, cocoa, and sugar. The Téké Plateau, lying north of the capital, is a region of low hills and rolling, sandy plains. The Congo Basin in the northeast consists of tropical rain forest and flat, swampy valleys. Because of its rugged terrain, the northern part of the country is much less developed than the south.